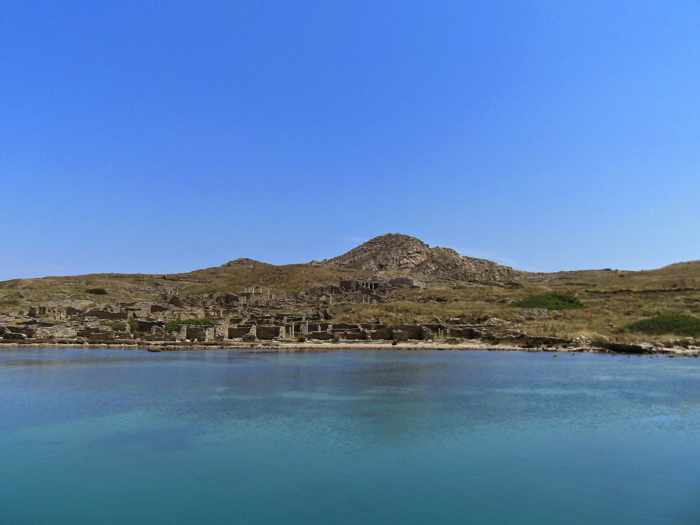 The “sacred island” of Delos is seen in a photo from the Google+ page for Delos Tours, the firm that runs ferries between Mykonos and Delos. Here’s a brief background for readers who might not be familiar with Delos. The island, situated just over 2 km west of Mykonos, is one of the most important historic and archaeological sites in Greece. It’s often called “the sacred island” and “the island of light” because, in Greek mythology, it was the birthplace of Apollo, the god of light, and Artemis, the goddess of night light. During its glory days between 166 BC and 69 BC, Delos was a wealthy shipping hub and one of the world’s leading centers of commerce. Home to more than 30,000 people, the city went into decline after it was looted and razed in two separate attacks; residents gradually left the island, and eventually Delos was abandoned completely and almost forgotten. 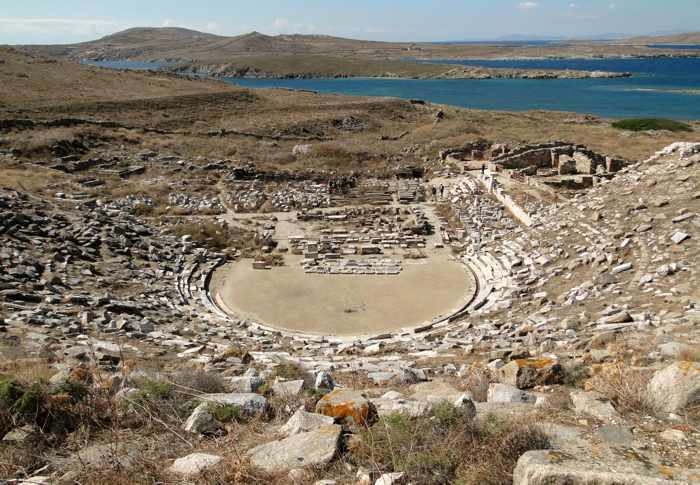 Delos regained international attention when archaeologists began excavating its ruins in 1872. Small numbers of travellers, mainly from Europe, started visiting the island to view the fascinating historic sites that were gradually being unearthed. Over the decades, the trickle of tourists turned into a steady stream of sightseers from around the world, and today Delos is a top tourist attraction drawing more than 100,000 visitors each year. Delos is widely considered a “must see” attraction for people visiting Mykonos, and I personally recommend that visitors schedule a half-day trip to Delos during their Mykonos holidays, especially if it’s their first visit to Greece. 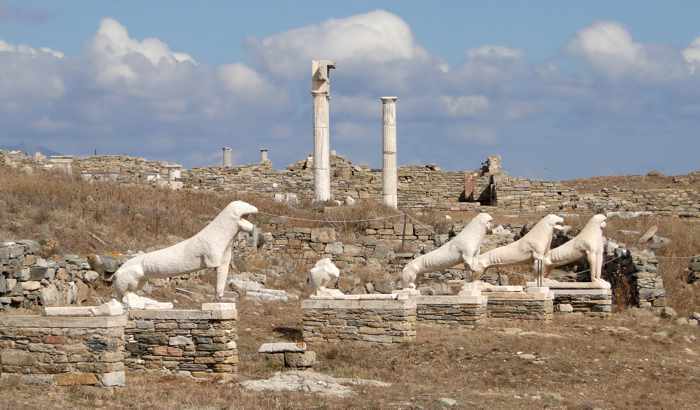 All of Delos is a protected archaeological site, and visitors are not permitted to stay on the island overnight; hence, there are no accommodations (the nearest available lodging is on Mykonos). Besides the extensive ruins, which extend across most of the island, there is a museum that houses sculptures, wall paintings, pottery and thousands of small artefacts discovered during the excavations. A cafe in a separate building sells beverages and light snacks. 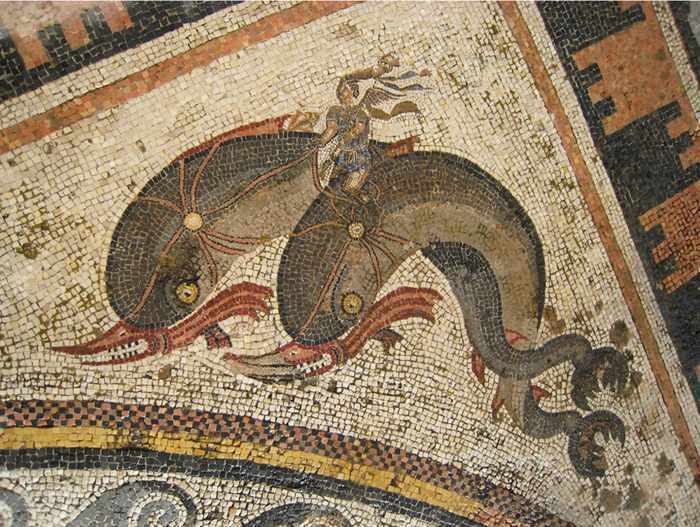 Some of the antiquities and sights most popular with tourists include: spectacular floor mosaics in the House of Dionysos, the House of the Dolphins, the House of the Mask, and the House of the Tritons; a marble amphitheater; several different agoras, sanctuaries and temples; the Sacred Lake and the Terrace of the Lions. You’ll see many of the island’s top sights while a narrator describes the history of Delos in this informative 9.5-minute film by Expoza Travel. Please click on the link below to continue reading on page 2, where you’ll find information about Delos ferry ticket and site admission prices, ferry schedules, guided tours, private charters to Delos, and more. we came across to your reference and we are really happy to discover that you point out so many positive things about Mykonos Rib Cruising family. We remain at your disposal for any further details you might need. Great way to describe the post. Delos the beauty shines in the photo. Great to add this in the upcoming list. Helps me a lot of what to expect at Delos and how to get to Delos. I had visit Delos last summer during a sailing trip in the Aegean. Thrilled by its view. Nice article. I have a question in regards to sailing to Delos. Can we actually use the dock at Delos or anchor? I visited Mykonos a few years back and found it too crowded in the marina, so thought we would sail directly to Delos, dock and do a tour then continue to Naxos. I have no idea. Try contacting the Mykonos port authority for information. 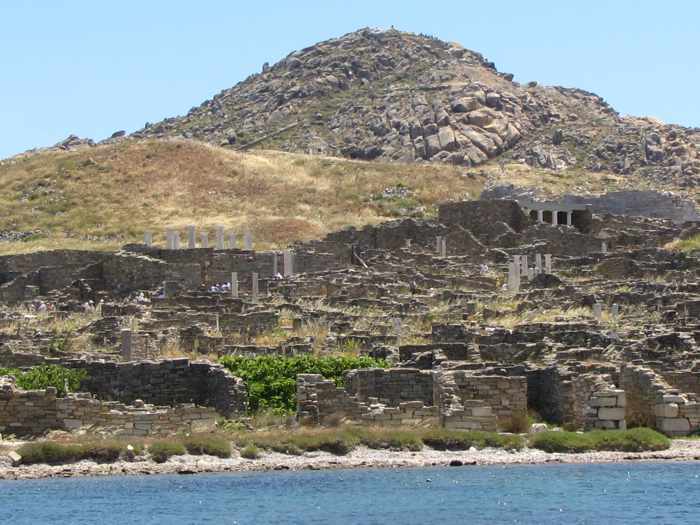 I have just returned from my sailing trip which included a stop to see Delos. Anchoring is fine across the bay, they also allow drop off and pick up at the dock. Use your tender to ferry people back and forth. There is no swimming or anchoring in the bay as it is an historic site and not excavated, staff will whistle and wave you out. Hiring a local guide is worth the cost. Bring bottled water and wear a hat. Thanks very much for posting that information, Fred! Thanks for much for the wonderful site and information. This will be my go to site for Delos. Usually those who go to Mykonos for vacation do not visit Delos! I think it is worthwhile to rent a boat in Mykonos and sail up to Delos! Surely, people want to rent a car in Mykonos for their walks but everyone can find 1-2 hours for Delos! No it has not been renovated. The museum had to be closed for several weeks in the spring for interior repairs, but not a complete renovation. It will be open in 2018 unless major problems requiring additional repairs arise in the meantime. Many thanks from a fellow Torontonian for such an interesting and very informative post. I plan to visit Delos (from Mykonos) this October and you saved me a lot of research time! Do you know if there are afternoon tours of Delos?? The only afternoon boat to Delos leaves Mykonos at 5 pm. Guided tours are available to passengers on this departure.